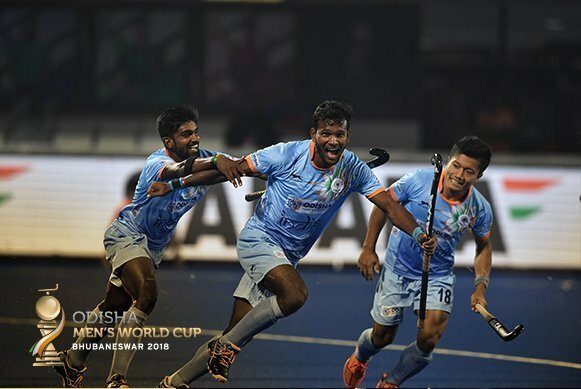 Bhubaneswar, India: It all came down to goals in the final round of Pool C matches at the Odisha Hockey Men’s World Cup 2018. Belgium knew they had to score a lot of goals against South Africa if they were to keep India from taking top spot in the pool. While their penalty corners were effective, the Red Lions lacked bite when it came to scoring from field play and a number of chances to score went to waste. In the second match, host nation India knew they purely needed a win over Canada in order to top the pool and win a ticket straight to the quarter-finals. A Canadian team, who defended brilliantly for the first two quarters and were on equal terms for the first three quarters, put pressure on India, but an exhilarating fourth quarter saw India storm to a 5-1 win and take pole position in Pool C.
The opening game of the day was just 35 seconds old when South Africa (FIH Hero World Ranking 15) took the lead against their higher-ranked rivals, Belgium (WR:3). Nicholas Spooner was the scorer as he gathered the ball from a fantastic pitch-splitting pass from Rhett Halkett and then slammed it into the corner of Vincent Vanasch’s goal. However, Shane McLeod’s Red Lions have come to Bhubaneswar with a firm intention to make the podium and the higher ranked team quickly recovered from the setback and began to turn the screw, not just on South Africa, but also on India, who were vying with the Red Lions for the top of the pool. At the start of the game India had a superior goal difference – plus five to Belgium’s one – so Belgium’s task was clear. McLeod says that penalty corners have been a focal point for his side and the team soon demonstrated their efficiency in this area. Alexander Hendrickx is the in-form penalty corner specialist for Belgium at the moment and his two goals from penalty corners in the first half sandwiched a neatly taken field goal by Player of the Match Simon Gougnard. A fourth goal was added when Loick Luypaert also showed his prowess from the top of the circle. The half-time stats spoke for themselves, while possession was nearly equal between the teams, the significant figures for Belgium were three penalty corners, three goals. South Africa made their own chances in the opening 30 minutes with the best chance falling to Dayaan Cassiem. The midfielder received the ball in the centre of the Belgium circle and should have capitalised. His shot flew wide of Vanasch’s far post. The second half saw Belgium continuing to press forward, and Tom Boon will be disappointed not to have added to the score when he was through on goal twice in quick succession but was not balanced enough to shoot with any force. A series of three Belgium penalty corners were dealt with by Gowan Jones who replaced Rassie Pieterse in the South Africa goal. Hendrickx thought he had scored his third goal when he slotted home a penalty corner, but the injected ball was judged not to have left the circle before Hendrickx shot for goal. The final minutes of the third quarter saw South Africa pile on pressure of their own. A quick break found captain Tim Drummond on the baseline and he was able to slip the ball back to goalscorer Spooner. Unfortunately for South Africa, Spooner shot over the crossbar. Seconds later a penalty stroke was awarded to South Africa but was disallowed on referral. Belgium went into the final quarter knowing they needed to score more goals in order to keep the pressure on India and Cedric Charlier was quick to deliver. He pounced on a ball that was slipped from the baseline by Gougnard, who had muscled his way past the South Africa defence. The drama intensified in the final few minutes as Belgium sought another goal. For their part, South Africa were working hard to find a second goal but it was Belgium who found the net as the game came to an end. For Belgium’s goal difference this was crucial but the referral showed that the goal was scored after the final hooter had gone and the score remained 5-1 meaning India just needed a win over Canada in the second match of the day to finish top of the pool. The second Pool C match pitted a stoic Canada team, who had conceded no penalty corners prior to this match, against an Indian side determined to take the top of the pool position. The first quarter saw a pressure cooker of an atmosphere slowly build on the pitch and in the stands. That tipped over in the 12th minute as Harmanpreet Singh shot his team into the lead from a penalty corner after the Indian forwards had piled pressure onto the Canada defence. Prior to that moment, the Canada goalkeeper Antoni Kindler and his defence had withstood everything that Manpreet Singh and his men had thrown at them. The second quarter saw much of the same pattern. Manpreet Singh was becoming more and more pivotal to the India attack, sending aerial balls high and deep into the Canadian defensive area, feeding, among others, Lalit Upadhyay who danced around the Canadian circle but was unable to get his shot away. Akasdeep Singh came closest to doubling the lead, as he picked up a bouncing ball and shot to Kindler’s right-hand post. The tall ‘keeper was down quickly to make the save and keep the India lead to 1-0. While Canada were mostly playing a defensive game, they also created their own chances. Keegan Pereira, who was born in India, forced a save from PR Sreejesh and Floris van Son fed a lovely ball through to Oliver Scholfield but he was unable to find a way past Sreejesh. As the second half go under way, Harendra Singh, India’s Head Coach, called for his players to play a calmer game. He said the pressure his team was creating was good, but to really capitalise, they had to keep their composure in front of goal. The importance of composure in front of goal was demonstrated perfectly by Canada’s van Son who momentarily silenced the crowd when he brought Canada back on equal terms. The player, who came in as a replacement for Brandon Pereira, was perfectly placed to receive the ball and shoot smartly past Sreejesh. Emerging for the final quarter, India knew they had to score and put the game to rest. There was a definite ramping up of the pressure and with just one minute of the quarter played, a great ball into the circle by Kothajit Khadangbam was cleared by Kindler but picked up by Chinglensana Kangujam, who shot home to restore India’s lead. As the spectators went wild, India fed off the energy and there was a visible shift through the gears, leaving Canada unable to match their opponent’s speed and attacking flair. Upadhyay made it 3-1 when he slammed home a few seconds later and Amit Rohidas put the game beyond doubt when he rifled home a penalty corner to make it 4-1. A fifth goal and a second for Upadhyay – voted Player of the Match – was the final scoring action of the game, although Canada had to endure a series of penalty corners before the final whistle blew. Despite the loss, Canada qualify for the cross-over matches by virtue of a better goal difference than South Africa. On Sunday 9th December, the final matches in Pool D will take place, with Malaysia (WR:12) facing Germany (WR:6) at 1700 IST (UTS+5:30) before all the pool matches are wrapped up when Netherlands (WR:3) take on Pakistan (WR:13) at 1900. Germany are currently top of Pool D with two wins from two matches, including a 4-1 win over their European rivals Netherlands and a 1-0 win over Pakistan. Netherlands are in second place on three points and Pakistan are holding onto third place ahead of Malaysia, with a healthy goal difference. The pool winner will earn a direct ticket to the quarter finals, while the teams that finish second and third will go into the cross-over play-offs. The team that finishes fourth will be eliminated from the competition. The cross-over matches will be as follows, although not necessarily played in this order. The winners of these matches will play in the quarter-finals, with the losing teams being eliminated. The quarter-finals will be as follows, although not necessarily played in this order. The winners of these matches will qualify for the semi-finals, with the losing teams being eliminated. The semi-finals will be as follows, although not necessarily played in this order. The winners of these matches will play for 1st and 2nd places (the final) and the losers will play for 3rd and 4th places. These matches will take place on Sunday 16 December 2018. The score at the end of the regulation time of any match will be registered by the FIH as the result of the match. If at the end of regulation time the result is a draw, in order to establish an outright winner of a classification match for the purpose of the competition, a shoot-out will be played to establish the winner.